Your first job is choosing which PCmover software you need: PCmover Home or PCmover Professional. Both let you transfer information only from one old PC to one new PC. That’s usually not a problem, but keep in mind that you can’t give the program to a friend after you’ve transferred your files. PCmover Home: This minimalist package moves files, settings, and user profiles to your new PC. However, it won’t move apps and programs. PCmover Professional: The more popular (and more expensive) option, this software copies apps and programs to the new PC, as well as files, settings, and user profiles. PCmover Professional helps you move from an old PC to a new one. 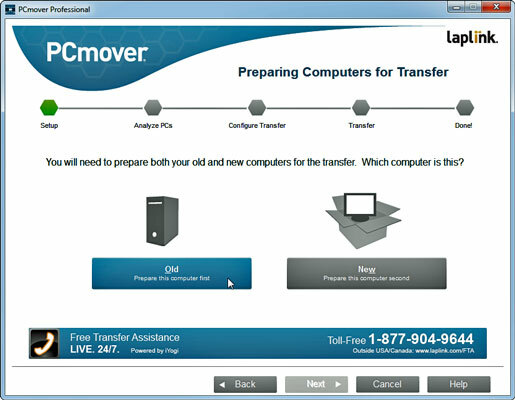 If you plan to transfer your files over a network, you can buy and download your chosen PCmover program from Laplink’s website. Most people, however, find a better deal by buying the PCmover Ultimate boxed program from Amazon (www.amazon.com). That package includes PCmover Professional and a transfer cable, and it costs less than the version on Laplink’s website. The PCmover programs are copy‐protected, so you need a working Internet connection before you can begin using them. Also, depending on the amount of information on your old PC — and the way you connect your computers — the transfer process can take several hours.